Heat generated by the gravitational pull of moons formed from massive collisions could extend the lifetimes of liquid water oceans beneath the surface of large icy worlds in our outer solar system, according to new NASA research. This greatly expands the number of locations where extraterrestrial life might be found, since liquid water is necessary to support known forms of life and astronomers estimate there are dozens of these worlds. These frigid worlds are found beyond the orbit of Neptune and include Pluto and its moons. They are known as Trans-Neptunian Objects (TNOs) and are far too cold to have liquid water on their surfaces, where temperatures are less than 350 degrees below zero Fahrenheit (below minus 200 Celsius). However, there is evidence that some may have layers of liquid water beneath their icy crusts. In addition to bulk densities that are similar to other bodies suspected to have subsurface oceans, an analysis of the light reflected from some TNOs reveals signatures of crystalline water ice and ammonia hydrates. At the extremely low surface temperatures on these objects, water ice takes a disordered, amorphous form instead of the regularly ordered crystals typical in warmer areas, such as snowflakes on Earth. Also, space radiation converts crystalline water ice to the amorphous form and breaks down ammonia hydrates, so they are not expected to survive long on TNO surfaces. This suggests that both compounds may have come from an interior liquid water layer that erupted to the surface, a process known as cryovolcanism. Most of the long-lived heat inside TNOs comes from the decay of radioactive elements that were incorporated into these objects as they formed. This heat can be enough to melt a layer of the icy crust, generating a subsurface ocean and perhaps maintaining it for billions of years. But as the radioactive elements decay into more stable ones, they stop releasing heat and the interiors of these objects gradually cool, and any subsurface oceans will eventually freeze. However, the new research found that the gravitational interaction with a moon can generate enough additional heat inside a TNO to significantly extend the lifetime of a subsurface ocean. The orbit of any moon will evolve in a gravitational “dance” with its parent object to achieve the most stable state possible – circular, aligned with the equator of its parent, and with the moon spinning at a rate where the same side always faces its parent. Large collisions between celestial objects can generate moons when material is splashed into orbit around the larger object and coalesces into one or more moons under its own gravity. Since collisions occur in a huge variety of directions and speeds, they are unlikely to produce moons with perfectly stable orbits initially. As a collision-generated moon adjusts to a more stable orbit, mutual gravitational attraction causes the interiors of the parent world and its new moon to repeatedly stretch and relax, generating friction that releases heat in a process known as tidal heating. The team used the equations for tidal heating and calculated its contribution to the “heat budget” for a wide variety of discovered and hypothetical TNO-moon systems, including the Eris-Dysnomia system. Eris is second-largest of the currently known TNOs after Pluto. 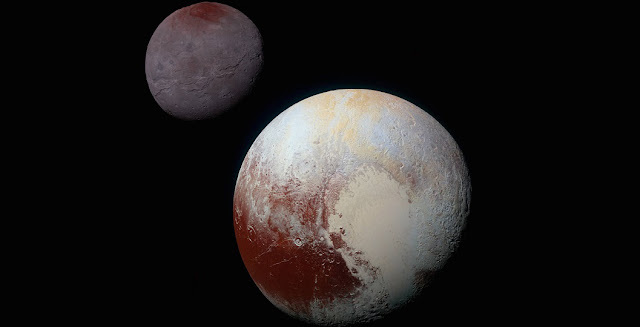 “We found that tidal heating can be a tipping point that may have preserved oceans of liquid water beneath the surface of large TNOs like Pluto and Eris to the present day,” said Wade Henning of NASA Goddard and the University of Maryland, College Park, a co-author of the study. Although liquid water is necessary for life, it is not enough by itself. Life also needs a supply of chemical building blocks and a source of energy. Deep under the ocean on Earth, certain geologically active places have entire ecosystems that thrive in total darkness because hydrothermal vents called “black smokers” supply the needed ingredients in the form of energy-rich chemicals dissolved in superheated water. Tidal heating or heat from the decay of radioactive elements could both create such hydrothermal vents, according to the team. The team would like to develop and use even more accurate models of tidal heating and TNO interiors to determine how long tidal heating can extend the lifetime of a liquid water ocean and how the orbit of a moon evolves as tidal heating dissipates energy. The team would also like to discover at what point a liquid water ocean forms; whether it forms almost immediately or if it requires a significant buildup of heat first. The research was funded by the NASA Postdoctoral Program, managed by the Universities Space Research Association, Columbia, Maryland, as well as the NASA Outer Planets Research Program grant NNX14AR42G. The research was conducted in collaboration with the Sellers Exoplanet Environments Collaboration at NASA Goddard.